Children today are bombarded with plastic, limiting toys that do not expand their imaginations or aid their development. Not only can plastic toys be harmful to children’s health, but the production of plastic toys further increases our dependence on petroleum and leaves a greater carbon footprint than natural, wooden toys. There are many companies that produce wooden toys; however, not all of these companies provide information about the kind of wood they use or their sustainability practices. In addition, many of these companies manufacture their toys in China, where constant monitoring is required to ensure dangerous substances, such as lead, do not accidentally enter into production, such as the recent recall of Thomas the Tank Engine wooden railway toys exemplifies. Plan Toys is a company you can trust! trees and burn them to produce charcoal, in order to clear the land for replanting. Plan Toys increases the value of these trees by using them to produce their beautiful line of wooden toys. The wood is kiln-dried to avoid bacteria and pest infestation, thus making the rubberwood naturally preservative free and safe for children. All paints are non-toxic, the glue used is latex-based, and all corners are rounded for safety; however, some toys do contain plywood. Plan Toys ensures that their “plywood complies with E1 standards, thus ensuring emissions of urea formaldehyde at levels below those acceptable to the World Health Organization (WHO)”. All packaging materials are recyclable and do not contain PVC. To read more, please visit Green Options: Green Family Values: Natural, Wooden Toys by Plan Toys. WOW! Your blog is wonderful. I am so thankful that I came across it. It touches upon everything I have been thinking about. Thanks for all of the wonderful information. What an awesome site! Thanks! Thank you for the great information in your blogs. 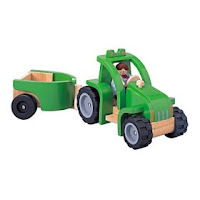 I just ordered a vegetable garden play set from Plan Toys to give to my god daughter for her 3rd birthday. I’m happy to be able to give her a non-toxic gift she can play with and help to create a petro-chemically independent world at the same time! Well,……..Your blog is wonderful. I am so thankful that I came across it. You have a very interesting blog. I totally agree, the more natural you raise your children the healthier adults they will be.